While the name Microplane® is trademarked, it has become a term used generically within the culinary world to describe a grater that looks like a traditional woodworker’s rasp, and rightfully so because that is where the design originated. The story goes like this: A Canadian housewife took one of her husband’s woodworking tools into the kitchen and discovered that it produced light fluffy orange zest with minimal effort. By the mid-1990s, Grace Manufacturing, located in Arkansas, had created a business of turning this traditional woodworking device into a must-have kitchen tool. The line started with one zester/grater, which had a specific pattern of holes. 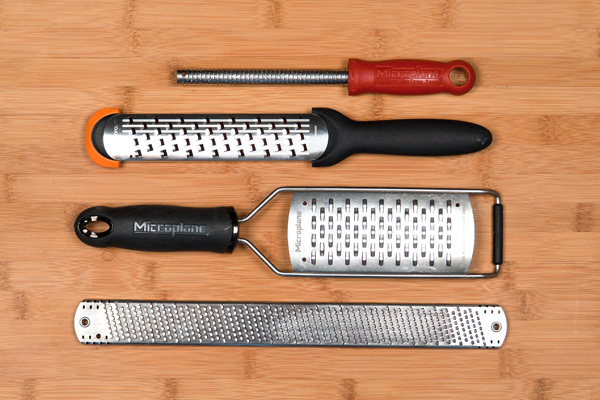 The brand has since branched out and makes Microplane® tools of varying shapes and sizes in spice, fine, coarse, extra coarse and ultra coarse versions as well as one with a star-shaped hole, one that creates ribbons and another that they call a large shaver (which can make Parmesan curls). The company still makes woodworking tools as well. Made from surgical stainless steel, the razor-sharp holes allow for very precise grating. The holes are so sharp that it is easy to remove just the colored zest of citrus without touching the white pith beneath, as so many classic box graters do. As Microplane® describes it, their holes are created chemically; ferric chloride etches the holes, while most graters have teeth that are stamped out and are not nearly as sharp. The sharpness of Microplane® graters allows for use with very hard as well as soft foods. Other companies have come out with similar tools, specifically Cuisipro, which calls theirs Surface Glide Technology™ and has a patent pending. They have their own shapes and styles and the holes and grating surface areas do, indeed, look and act similarly to Microplane®. In the top image, you can see several styles. 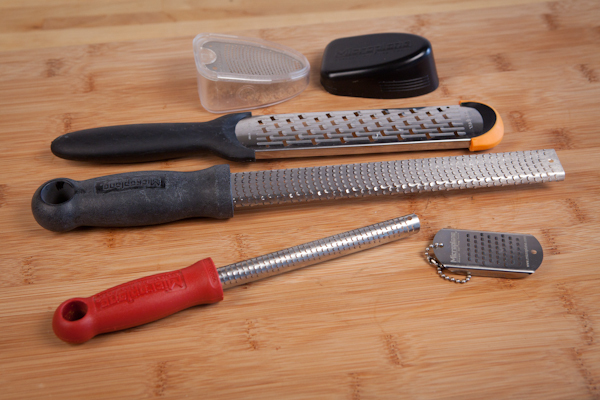 Top to bottom: a Microplane® nutmeg grater that also contains storage for the whole spice; a Cuisipro grater with an orange top; the original Microplane®; a small red-handled Microplane® spice grater; a mini Microplane® zester. 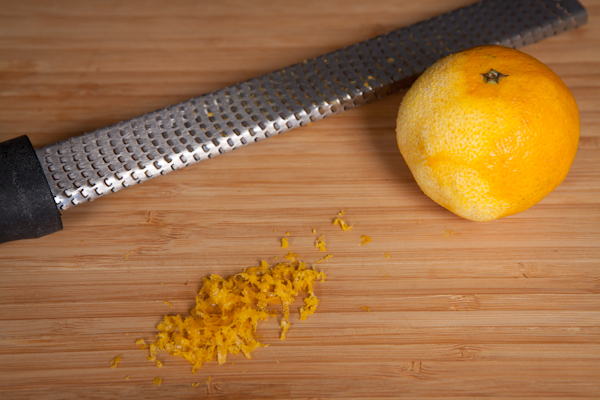 Below you can see the light, fluffy orange zest created by the original Microplane® tool. Note how the orange has not been grated down to the white pith. These tools are very sharp and should be used with care. Because Microplane® tools create such light, fluffy citrus zest, the zest measures differently from zest that has been created with a traditional box grater. Some recipes will tell you what kind of grater they have used. We use Microplane® zester/graters in the Test Kitchen all the time and will state in the ingredients that we are calling for “finely grated orange zest.” Zest created with a box grater is usually coarse.